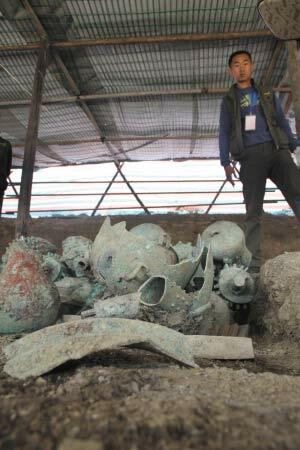 Archaeologists have recently uncovered an ancient tomb in Yishui county in Shandong province, bringing artefacts that have been buried for over 2,600 years to light. Those uncovered included everyday objects such as make-up brushes as well as royal objects. Discovering the site of the artefacts is only the beginning, archaeologists then have to undergoing careful excavation to uncover the buried treasure. But their efforts have paid off - a bell set has been discovered amongst a host of objects. This signifies the prestigious status of who lies in the tomb. Li Jian, archaeologist, said, "We discovered 3 sets of bells, under the royal custom, only the emperor has 4 sets of bells. People who are allowed to possess 3 sets are regional kings under the emperor." Also unearthed were small objects like make-up brushes, giving us a glimpse of everyday life in ancient China. Prof. Ren Xianghong, Shandong University, said, "It's certainly connected to decoration or make-up, the part unearthed is a handle made of jade, we think it's hollow inside where the brushes are placed." While the exact identity of the owner of the tomb remains unknown, archaeologists believe it most likely belongs to a king or queen of a vassal state of the emperor.